In this blog, we'll take a look at who might have actually shown up at the dates/times/locations. Who would have shown up? There are several possibilities. Let's start with an obvious one. Another possibility is that Josef, who had been sent to England with £500 - more than double what the earlier agents had - was to deliver some of the money to another agent. TATE had requested money from the Abwehr in mid-January 1941. Josef left on his mission on January 31, 1941, so it is conceivable that the Abwehr thought they could supply TATE with some funds at the same time. The fact that Karel Richter was sent a few months later with more money, supposedly for TATE, increases the likelihood of this option. The method by which Richter was to have connected with TATE also sounds rather similar to Josef's notebook. After Richter finally left on his mission towards the middle of May, TATE was told that he could expect to meet his "friend" at the Regent Palace Hotel on May 15th. Perhaps Josef had similar instructions (but different locations) at which he was to hand some money over to TATE. Richer had overheard Abwehr officers speaking of TATE and basically saying "Won't he be surprised to get money from several different sources" - this would suggest that the Abwehr was using different options. Given that one of the rendezvous locales Josef spoke of was "Derby Station", the only possible location of which is the town of Derby, northeast of Birmingham, one could wonder if Gosta Caroli (SUMMER) was a possibility. Caroli had spent time in Birmingham before the war and his landing site was actually relatively close to Birmingham. Caroli was meant to work the triangle covered by Birmingham-Northampton-Oxford (had he not been captured by the British) and a meeting at Derby Station might then make sense. If the German Abwehr believed that Caroli was transmitting free and clear (and not under the control of MI5), then it is possible that they may have seen him as a possibility. Unfortunately, SUMMER tried to escape his servitude to MI5 on January 13, 1941. MI5, through one of the other double agents (likely TATE), notified the Abwehr that Caroli had hung up his earphones. Whether the Abwehr received the message in time to alter Josef's assignation locations, etc is questionable. Given that there is no actual "Derby Station" noted in Josef's notebook, this would seem to be a rather long shot. This is always a possibility. In December 1941, MI5 questioned Richter at some length, concerned that there was an undiscovered spy operating in East Anglia. They had no proof of their suspicions but... it's always an option, that there was another spy who was flying under the MI5 radar and desperately needed funds. Ah yes, our friend Engelbertus Fukken. He landed near Milton Keynes in early November 1940 and managed to evade capture quite nicely. He found lodging in Cambridge and went about his business. By the time Josef left on his mission (January 31, 1941), Fukken had been in the UK for almost three months. He was running low on funds and, if he did manage to make contact with the Abwehr via his wireless transmitter, they may have decided to send some funds to him via Josef. This is a seemingly strong possibility but... there are a few caveats. Fukken committed suicide in a Cambridge air raid shelter in late March 1941. When MI5 found his radio at the Left Luggage counter at the local railway station, they discovered that the batteries in his transmitter were completely drained. He had obviously been using it... but whether he had made contact with the German Abwehr was another question. According to MI5 radio expert R.T. Reed, the aerial Fukken was given would work well with the nighttime frequency but would not have been suitable for the daytime frequency. Apparently, Fukken only tried his transmitter during the daytime, and not the nighttime. Although, my question is... how did MI5 know that? The other question is... would the Abwehr have attempted to send funds to him via another spy parachuted into England? MI5 report on the two bus tickets found in Engelbertus Fukken's pockets. Given that the first rule of espionage is to keep your operatives unaware of each other... the Abwehr would seem to have played a pretty slack game. They had connected SUMMER and TATE (they became friends before leaving for England). They had connected TATE and SNOW (the latter got some money to the former). They had connected SUMMER and SNOW (the latter had been asked by the Abwehr to assist the former after his landing in England). They had connected Richter and Jakobs (they knew of each other before leaving for England). If one spy was compromised, then all were compromised. Was it then outside the realm of possibility that the Abwehr would then connect Jakobs and Fukken? 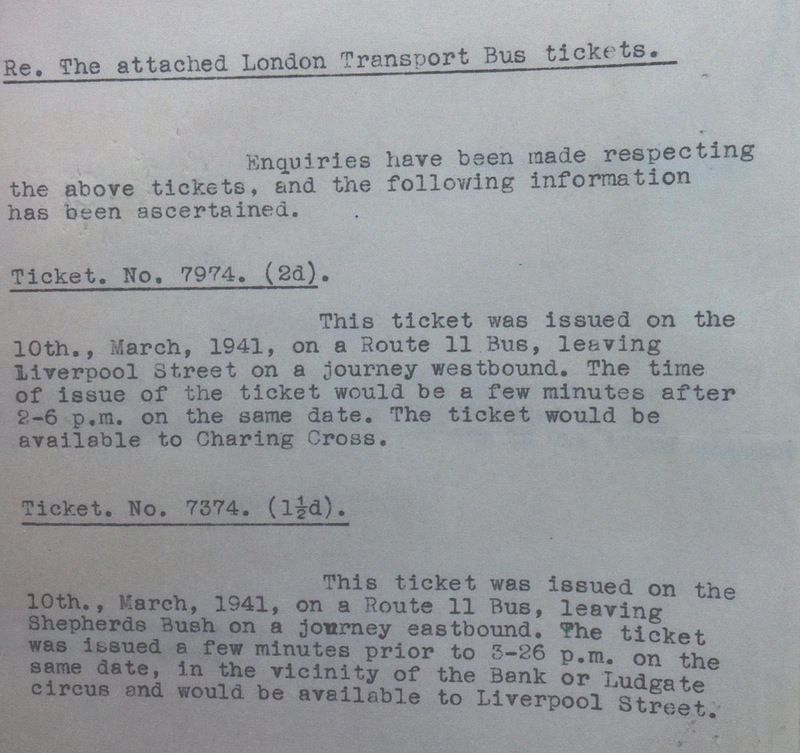 When MI5 investigated Fukken's possessions, they found two Route 11 London transport bus tickets in his pocket. 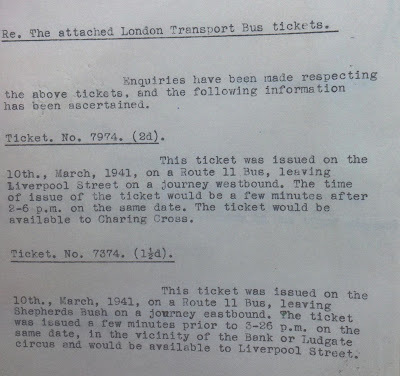 The tickets were for travel on March 10, 1941. One ticket originated at Liverpool Street (likely the train station) shortly after 2:06 pm and was for westward travel towards Charing Cross. The other ticket originated near Bank or Ludgate Circus shortly before 3:26 pm and terminated at Liverpool Street. The stretch between Liverpool Street and Charing Cross comes nowhere near the two possible London rendezvous points that Josef had within his possession (Zoological Gardens and possibly Regent Park Station). Perhaps Fukken came to London on other business? To meet another spy? Mind you, Fukken would have had less than an hour and a half between his departure from Liverpool Street and his boarding a return bus at Bank/Ludgate Circus. There is of course, always the possibility that Fukken made other trips to London, but that he did not keep the ticket stubs. Another possibility is that Josef would have met a Japanese operative. After Richter failed to show up for TATE, the Abwehr crafted a very complex plan whereby TATE could meet a Japanese operative on a London Transport bus. TATE told the Abwehr that Bus #11 did not stop at Victoria Station and suggested Bus #16. In the end, despite a few hiccups, the hand-off did work and TATE got a few hundred pounds from a operative attached to the Japanese embassy. The one perplexing thing is... Bus #11 actually did have a stop at Victoria Station. It wasn't the terminus but... it did pass through there. Given that Fukken had taken Bus #11... and the Abwehr suggested Bus #11 to TATE... this leaves one wondering if Fukken did indeed meet someone on March 10, 1941... or hoped to meet someone. As for Josef... it would seem to be a long shot that his instructions would have been to meet a Japanese operative. One would think that if Josef had made radio contact with the Abwehr and had run short of funds, that they would have suggested specifics of a meeting rather than some all-purpose dates, times, locations. There must also have been some method of recognizing each other. TATE and Richter were both given recognition hints for assignations. Let us suppose (and this is a very big supposition) that the German cabaret singer Clara Bauerle had been trained by the Abwehr to follow Josef to England upon his communication of a successful landing. How would they have connected with each other? Perhaps, before Josef left for England, he and Clara decided to come up with some locations, dates and times whereby they could connect. Given that they knew each other, there would have been no need for elaborate recognition notes. This is a possibility as Josef's notebook seems to be outside the normal Abwehr methodology. Another option is that Karel and Josef set up some times, dates, locations whereby they could connect with each other. Again, they would have recognized each other so no need for a system of recognition. Karel Richter made no hint of this during his interrogation and given that we don't know if Josef was questioned in detail about the notebook at Camp 020... the answer will likely never be known. A last, rather off-the-wall possibility, is that Josef had communicated his mission to Lily Knips, the Jewish refugee who lived at 9 Compayne Road in London. Lily did admit to MI5 that she had received a couple of mysterious letters in 1940 - one shortly after the German invasion of the Low Countries and one later, in the autumn of 1940. She kept neither letter. Is it possible that perhaps she had received another one, of which she made no mention to MI5, which outlined Josef's plans to meet with her in London? He did know her address but arriving unannounced on her doorstep might have been unwise. This is also a long shot option. Given that Lily Knips had a telephone, one would think that he could have simply called her up and set up a date and time to meet with her. After all of our investigation... we are left with an enduring mystery. There is no record of the notebook in Josef's possessions upon his capture nor upon his transfer to MI5. The first time it surfaces as a topic of conversation is during an interrogation in late June, 1941. There are no follow-up interrogations about the notebook's contents and the first time we get confirmation of its physical existence is at Josef's court martial. Even then, the notebook is not entered into evidence, but the wallet which contains it is entered as Exhibit 8. Why was the notebook not noted on the list of Exhibits - "wallet containing notebook". Josef claimed that the notebook contained details of three possible dates/times/locations for meeting other agents and securing additional funds. Upon detailed examination of the only page in the notebook that contains writing, there is evidence of two possible locations/dates. Only one of these locations matches Josef's verbal description - the Zoological Gardens. We are left with some unresolved questions. Where was the notebook between January 31, 1941 and August 4, 1941? If it was lost, where was it found? Why are there no further interrogations of Josef that center on the contents of the notebook? Why do the contents of the notebook not match the information that Josef provided at the court martial? If they are actual assignation dates/times/locations, then who was Josef planning to meet? We've looked at the possibilities in some detail but the truth remains an elusive creature.